The best food and beer pairing competition is back for some mouth-watering fun! 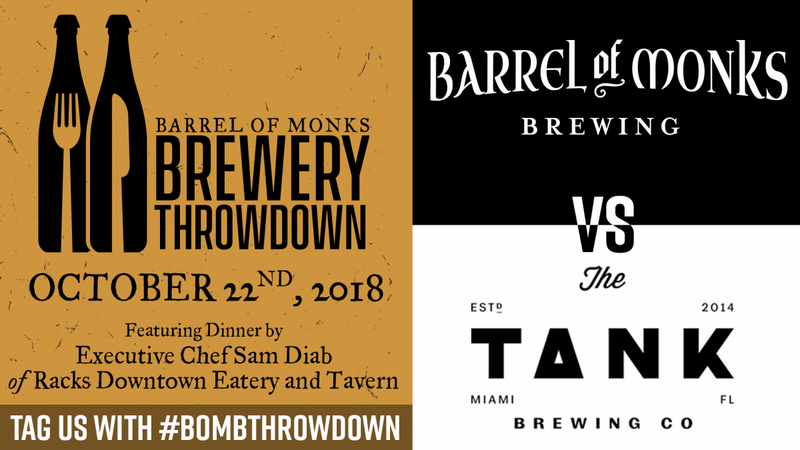 At this Throwdown, on Monday, October 22nd, from 6pm-9pm, we face off against our friends at The Tank Brewing Company! This Miami-based brewery is doing amazing things to further the craft beer culture of South Florida and we look forward to going up against them in an epic beer and food battle. Both sides will be pairing beers with tasty food courtesy of Sam Diab, the Executive Chef from Racks Downtown Eatery and Tavern. The last several Brewery Throwdowns sold out very quickly, so put down your utensils and act fast to partake in this clash of plates, palates, and pours. Your taste buds will thank you.